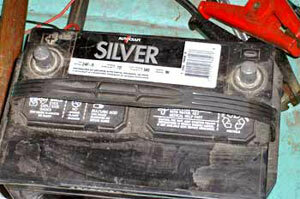 There are two ways to start a car with a dead battery. One way to do it is to "jump-start," which means to push it or let it coast downhill and then release the clutch. Automatic transmission-equipped cars, of course, need to be pushed to a considerably higher speed, and there are different techniques dictated by each manufacturer. This will be the subject of a future article, since we're going to concentrate on the other way to start a car using "jumper cables." The idea behind using jumper cables is simple. What you are doing, in effect, is using the charged battery on another car to start your car. The hard way to do this would be to remove that car's battery and install it in your car, but it's a lot of work and it still leaves one car inoperable. The easy way is to use jumper cables, which are heavy-gauge wires that are equipped with strong spring-loaded jaws for connecting to the two batteries. The first thing to consider when buying jumper cables is their quality. These cables have to conduct hundreds of amps of current to the starter (and other parts of the electrical system). High current requires large-diameter wires and effective connectors, and these things cost money. Cheap, ineffective and potentially dangerous jumper cables are found all over the place, so avoid them. A good set of cables will set you back about $40. Many people are confused about which terminals on one battery get connected to which terminals on the other. There's no reason to be, since you always want to connect the cables so that the two batteries are in parallel*. That means Positive to Positive, Negative to Negative! The (+) terminals are connected together and the (-) terminals are also connected together. Traditionally jumper cable connectors are red or black, with the red connectors going to the positive post and the black to negative. It really doesn't matter which color you're using, as long as you are connecting the correct posts together on the batteries. By the way, if you can't see the "pos" or (+) marking on a top-post battery, remember that the fattest of the two posts is always the positive one (look carefully, one really is fatter than the other). Side-post batteries are clearly marked. Get the two cars close enough for the cables to reach between batteries. Leave the "donor" car's engine running, and then connect the positive posts of the two batteries together. All done? Now connect the negative cable clamp to the donor car's battery, but don't connect the other end to the dead battery's negative post. Always put the red booster cable on the positive and black on negative. The other battery connections must be identical. Look at your battery carefully. Notice that the (+) terminal post is fatter than the (-) terminal. Why Not? Well, it's very likely that when you make that final connection that you'll get a spark. There's nothing wrong with that, but if your dead battery really isn't dead it might be emanating hydrogen gas. The spark might cause a little ball of flame, which would at the very least scare you, and possibly cause harm. A far safer practice is to connect the final negative clamp to the engine block, bumper (if you have a metal bumper) or other solid ground connection (don't connect near a carburetor — gas vapors, you know). That way any spark generated won't cause harm. All connected? Now rev up the donor car's engine to generate maximum current and wait about one minute to allow time for a little charging of your dead battery. Get inside and start your car. If it turns too slowly, turn off the ignition and wait another few minutes for the battery to charge. Now start the car. As soon as the car has started and is running smoothly, get out and remove the negative (black) jumper cable connector from wherever you clamped it. 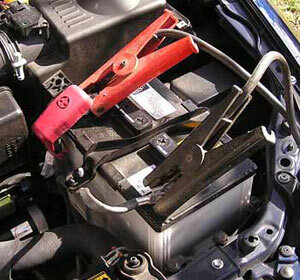 This will prevent any potential damage to both cars' alternators or generators. Afterwards, remove the cable connectors from both batteries, being careful not to allow the ends to touch each other or any metal on the cars.